The ProAir is designed to be worn in conjunction with a conventional body protector for the highest level of safety. During Cross Country phases in most high-level competitions, the organizers actually require the ProAir to be worn with a BETA approved Level 3 body protector, like the Point Two ProFlex. However, testing has shown our air vest to actually be more effective than a typical body protector when compared one to one. 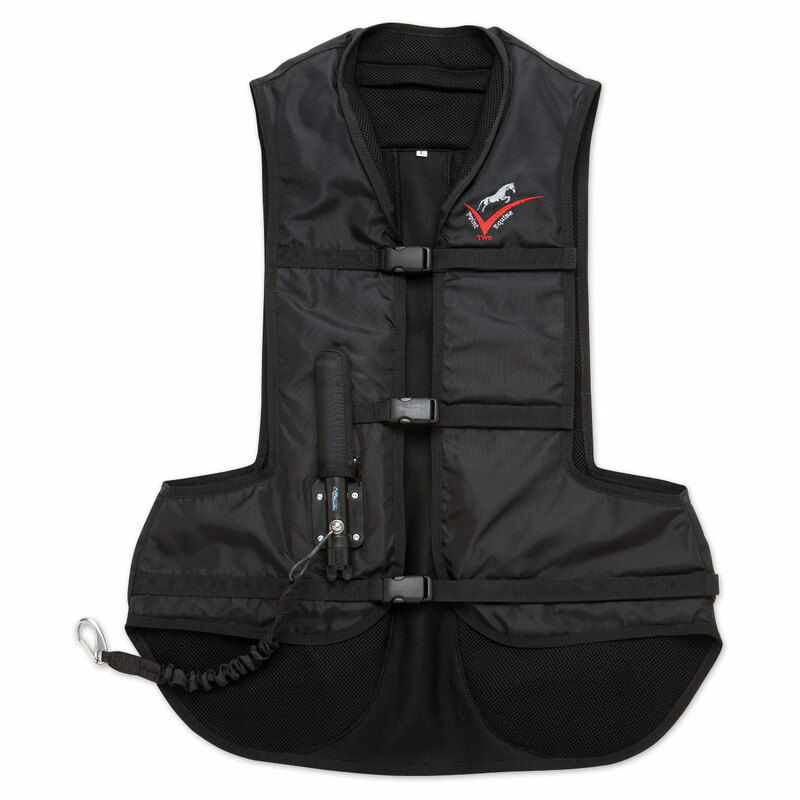 In fact, Point TwoAir Vests are the only air vests to be certified with SATRA M38 as an air vest alone. See our safety page for more information on certification. While trail riding or hunting, some riders use our vest on its own. They are pleased that it is lighter and less cumbersome than a typical body protector. We are pleased that they are wearing a higher level of protection, rather than nothing at all, like before. See our safety page for more information on certification. Need to return your Point Two? No problem! We're happy to take it back, but please note that all Point Two safety vests require a recertification service upon return, and a $58 service fee (per vest) will be deducted from the refund or store credit. S (25½" long, fits 4'11"–5'4"
Special Features Soft, lightweight and allows full freedom of movement. Washable polyester outer. Jacket will only inflate if the rider is separated from the saddle. Point Two Pro-Air Jacket is rated 4.6 out of 5 by 12. Rated 5 out of 5 by MuleGirl from Light weight and comfortable I love my new point two air vest. It is very light weight and even during the hottest days of the Georgia summer you barely know you have it on. 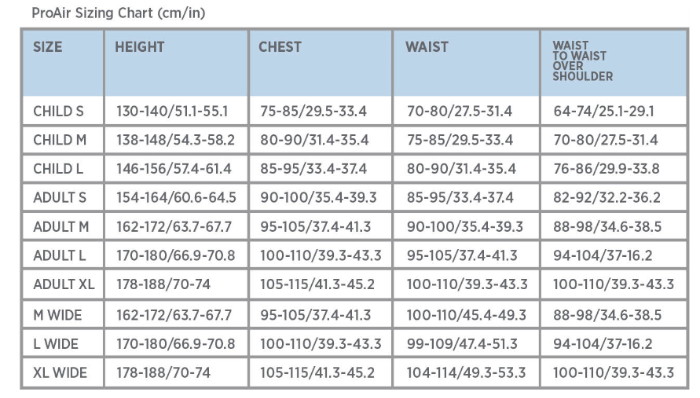 It is very comfortable and it adjusts easily for correct fit. Rated 5 out of 5 by Lghocelot from Finally deployed - really glad I was wearing it! I've owned my Pro-Air for almost 3 years, wear it every time I jump. Fell off last night while walking and chatting with trainer during a break when horse spooked. Bounced like the Michelin man, not even a bruise. While this wouldn't have been a bad fall, I'm glad to know the vest works so well. I feel much safer wearing it. Rated 5 out of 5 by Floyd from Really Love This Vest I can honestly say this is the best purchase I have made in the equine world. I have been riding for over 10 years and this is the first product that literally makes me feel safe while out on xc! I recommend that every event rider spends the extra dollars to buy this high quality product. I would also suggest buying the extra air canisters. Overall thoughts: Dont be cheap, safety is truely important!! Rated 5 out of 5 by agent2000 from Love the peace of mind that comes with the air-vest. Too bad they haven't figured out a way to put the canister in the middle, or balance out the weight. Other than that, love it! Rated 4 out of 5 by Buster1 from Oops! We recieved the jacket on the date promised, but no cannisters, which did arrive several days later. Went to put everything together, and oops, no stirrup bar attachment for the lanyard to attach to! Called SmartPak, and they made good quickly, sending the missing part right away. Rated 5 out of 5 by Jumpbig from Safety comes first After fracturing vertebras in a jumping fall, I needed to find something so I could continue with my passion. I purchased the Two Point vest and love it! I have been off with it, and it's amazing. It kept my spine straight and I didn't even feel like I went off. My husband is thrilled for my safety, he doesn't have to worry, and my confidence is great because your not thinking about any injuries and the pain. This is awesome and I recommend it to anyone that jumps, or has a sketchy horse! Money is not the concern when it comes to safety...happy riding!!!! Rated 5 out of 5 by WilleyNillie from Best Safety Device Yet I wouldn't let my daughter drive a car without airbags - why would I let her event without one? This product is awesome. It is a must have for all eventers! Rated 5 out of 5 by qrtrhrsrdr from Safer, more confident ride As a dressage rider, I'd never considered wearing a protective vest while riding, since I wasn't jumping. Having taken a fall which fractured my sacrum, I reconsidered. I always ride in a helmet, so why not want to protect my back and abs as well? I have been very happy with my Point Two, which covers from my neck past my coccyx, without the bulk of a traditional vest. It does not interfere with my dressage seat and feeling of my horses. It is not restrictive. It also gives me a little more confidence which allows me to to continue to ride in a deeper, more centered seat. It is a bit expensive but the added protection has been worth it. It would be nice to be more easily washed, though, and with a warranty, which is not evident with the product information. Rated 5 out of 5 by horseygirlca from Safety trumps price Love my new Point Two Air Jacket. It looks great on and makes me feel safe!